Boost your CPA Exam review with the ultimate online practice tool. 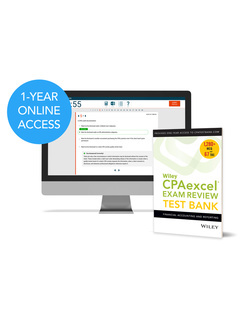 The Wiley CPAexcel Exam Review 2019 Test Bank: Financial Accounting and Reporting (FAR) is the most popular supplement in CPA-land with 2,000+ CPA Exam multiple-choice questions with detailed answer rationales, 75+ task-based simulations, and more. Use the test bank to sharpen your skills, replicate the real test environment, identify and tag weak subject areas, and customize question sets. License includes 1-year of online access to the FAR question set. A personal pin code is provided in the package that may be activated online at any time. Your license starts at time of pin code activation.